This is perhaps the most beautiful beach in the area. At one end is a tall limestone cliff that contains Tham Phra Nang Nok (Outer Princess Cave)a cave that is said to be the home of a mythical sea princess. Local legend says that during the 3rd century BC a passing royal barque carrying a charismatic Indian princess named Sri Guladevi foundered in a storm. The princess' spirit came to inhabit a large cave near the wreck, using power gained through many past lives to grant favours to all who came to pay respect. Local fisherfolk place carved wooden phalli in the cave as offerings to the Phra Nang (Holy Princess)so that she will provide plenty of fish for them. 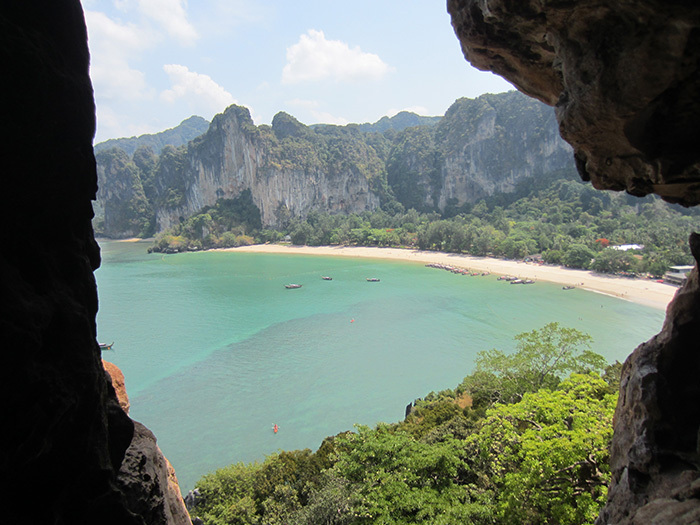 Inside the cliff is a hidden 'lagoon' called Sa Phra Nang (Holy Princess Pool) that can be reached by following a sometimes slippery cave trail into the side of the mountain. A rope guides hikers along the way and it takes about 45 minutes to reach the pool - guides are available from local guesthouses. If you turn left off the trail after 50m from the start, you can reach a ' window ' in the cliff that affords a view of Rai Leh West and East beaches.It's also possible to climb to the top of the mountain from here (some rock-climbing is involved) and get an aerial view of the entire cape and the islands of Ko Poda and Ko Hua Khwan (also know as Chicken Island) in the distance.